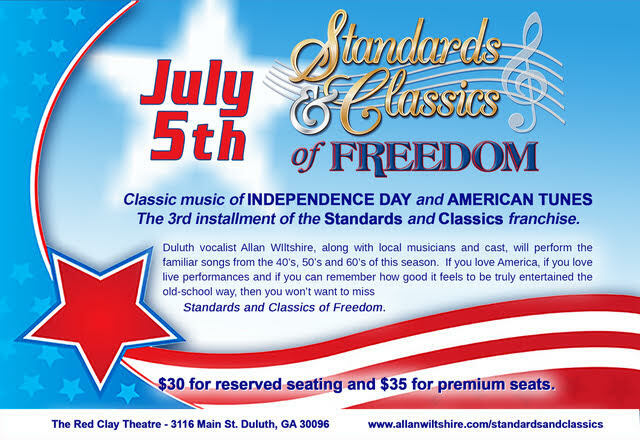 Friday, July 5, 2019 at 7:30 p.m.
Join us at The Red Clay Theatre as Duluth vocalist Allan Wiltshire premieres the third installment in the Standards and Classics franchise. Friday, February 15th, 2019 at 7:30 p.m.
What’s love got to do with it? EVERYTHING! The juice of life is LOVE. But that means different things to different people. What does it mean to you? What does it mean to the one that you love? Now that’s a conversation that I want to have with you and hundreds of others on Friday, February 15th at 7:30 p.m. at the Red Clay Theatre in Duluth for Standards and Classics of Love. The songs of the 40’-50’s-60’s and beyond will bring to all our memories what love means to us, how we have loved and how we will embrace love today. Saturday, December 1st, 2018 at 8:00 p.m.
Major holidays are often a time that we not only celebrate but also reflect. We reflect on those similar moments and how they have evolved over our life. We reflect on the people around us. We reflect on who we miss the most who aren’t beside us for whatever reason. We reflect on what that holiday means to us. Allan Wiltshire has an extra special gift of reflection to give us —The Standards and Classics Concert Series, a 1960’s variety show-type concert with live covers of iconic music from the 40s, 50s, and 60s that celebrate the essence of each holiday. Standards and Classics of Christmas is the first installment of the series. Allan and Standards and Classics partnered with Eddie Owen Presents at the Red Clay Theatre for this unique entertainment opportunity for the 2018-2019 season. The Red Clay Theatre, located in Duluth, seats 260. The Standards and Classics of Christmas Concert will be on December 1st, 2018 at 8:00pm.